Run in any race while supporting education for children in conflict! 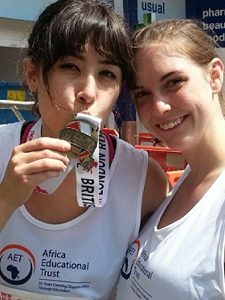 Join Africa Educational Trust’s running team, pick any race or ride you want to do and help create a better future for children growing up in conflict-affected countries in Eastern Africa. Whether you are a running novice or dedicated enthusiast, there are great races happening almost every month you can get involved with. Turning any run into a fundraising event is easy and you will be supported all the way by our fundraising team. Then we want to hear from you. Whether you have a race in mind, or if you are still not sure of your options, we are happy to talk to you about possibilities and how you can get started with AET’s running fundraising team. Contact us by phone (020 7831 3283) or email to start a conversation about being one of our runner. Event dates: various throughout the year. We are happy to help identify runs for you to join if you need assistance. Appropriate gear to get you through your run. Most races will make specific recommendations if they are needed.